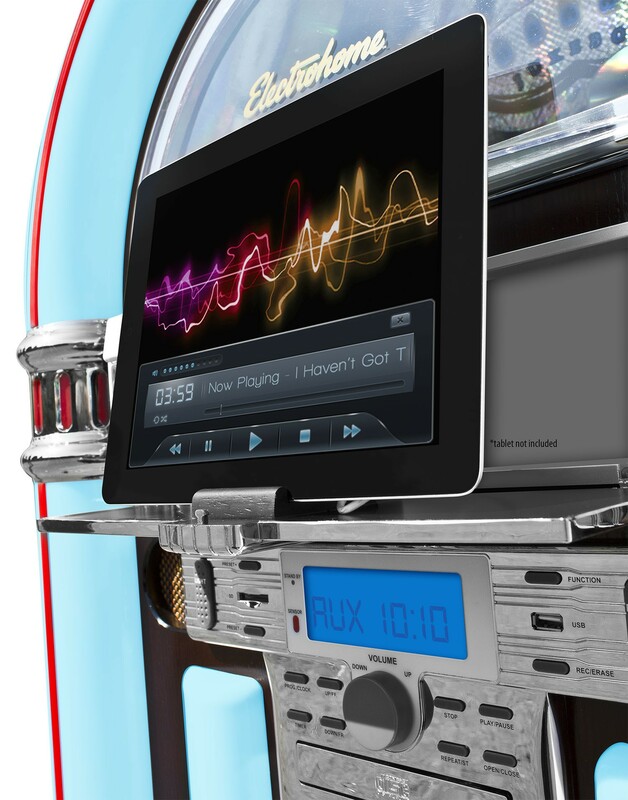 The timeless style of the 50s jukebox meets twenty-first century comfort: play songs from CDs, USB/SD drives and even your smartphone, tablet or MP3 player (with USB charging support and AUX input). 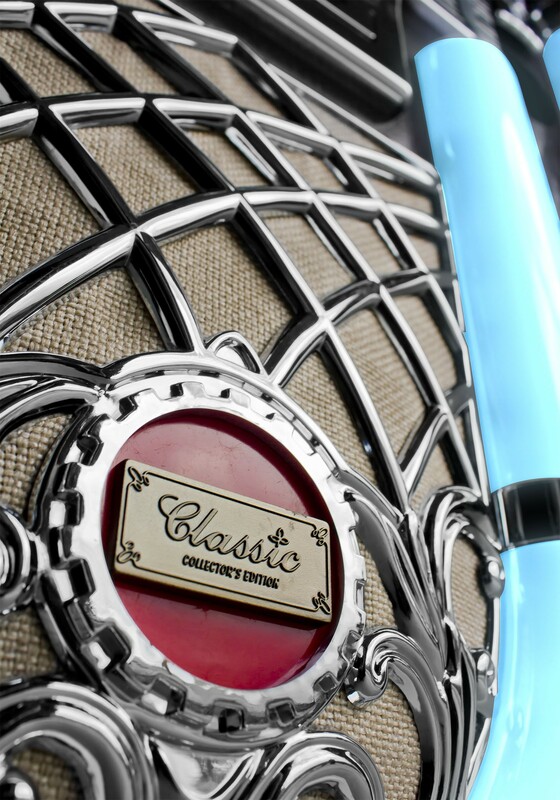 Imagine the crisp highs of a twelve-string acoustic guitar and the warm low ‘boom’ of a kick drum pulsating through four high performance speakers; analog production values have never sounded better coming out of an all wood, retro-styled cabinet. … while continuing the tradition of impeccably crafted audio products that have distinguished the Electrohome® name since 1907. Jukebox was just as described looked great sounded great. Did have an issue that only comes up once in a while. I worked through Treasure and she was wonderful. Problem is they could not recreate the problem in there testing. I told them it didn;t happen the last time time until I played it for two days. I was in no hurry to get it back, but testing is done and they are going to ship it back. So it other words, the product looked and sounded great. Treasure at customer service was great, but testing was in to big of a hurry to test. Jukebox came just as described. Everyone was amazed by the light show and the quality of the sound system. Very pleased with this product. 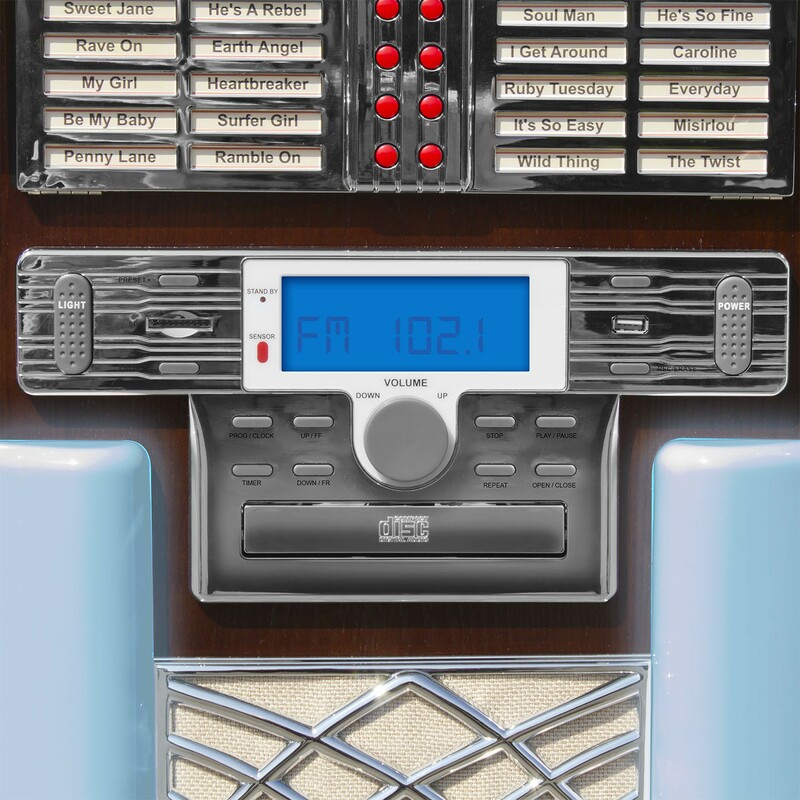 I am SUPER happy with this jukebox! The sound and the look are spot on and it's very easy to use. Those who have been over have enjoyed it as well. I would recommend purchasing the stand to give it that extra height. Product seems to be fine so far. we have only used the cd and radio but we are pleased with the sound. Wish you had a stand. The pictures on the advert were very misleading. 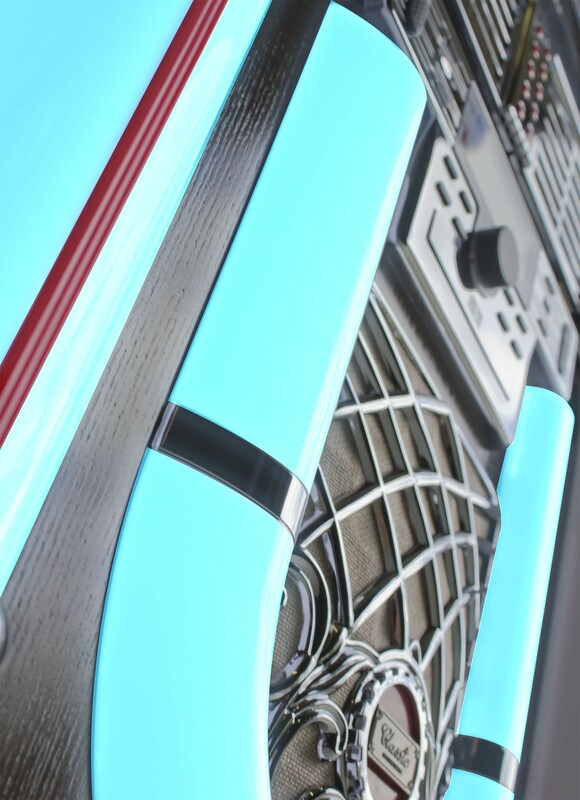 We expected the upper section to light up and display the "squiggly coloured lines as seen on the picture oppisite. We are extremely disappointed. Best bet for the money. Item was well packed and shipped fast. 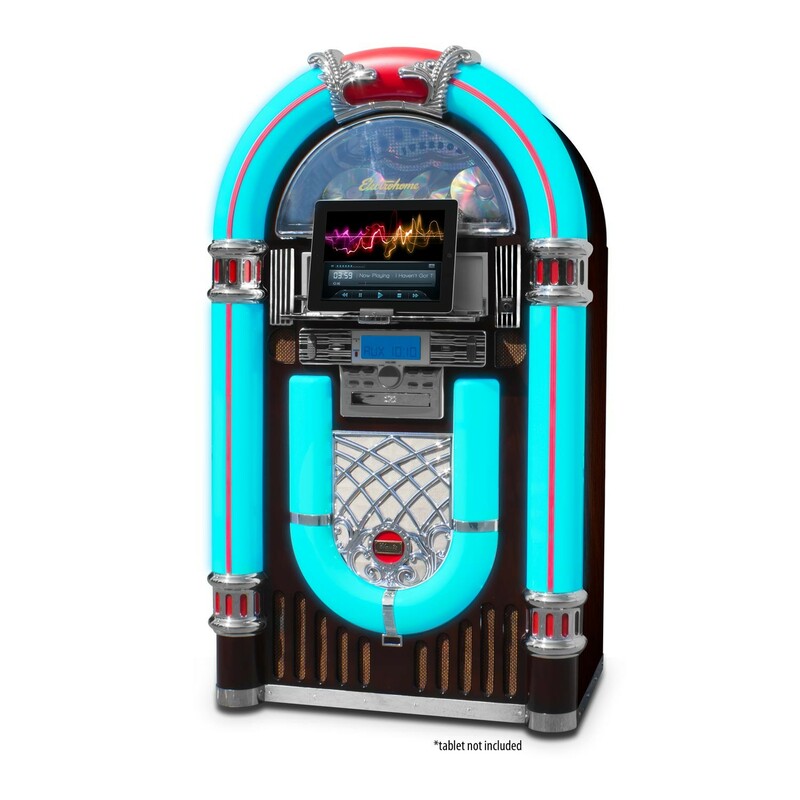 This Jukebox has excellent sound and is top quality. 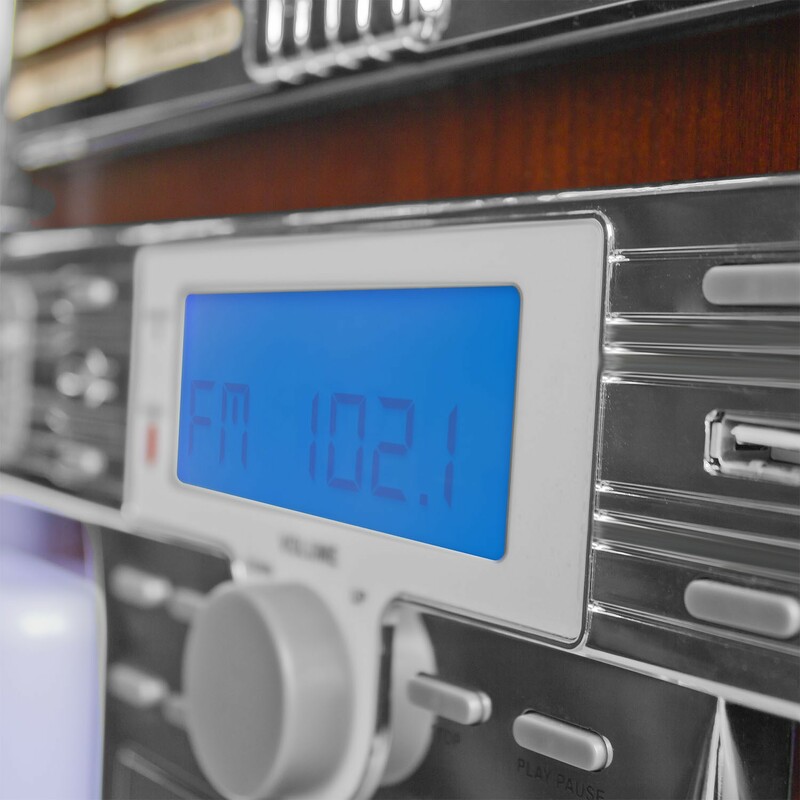 Radio plays clear and static free. The lighting system is awesome. If you have questions before buying you can call the seller - they are VERY helpful. This was a gift for my husband as we now enjoy it as a family. All around excellent !!!!!!!!!!!!! it is looks and sounds great,very happy I bought it. 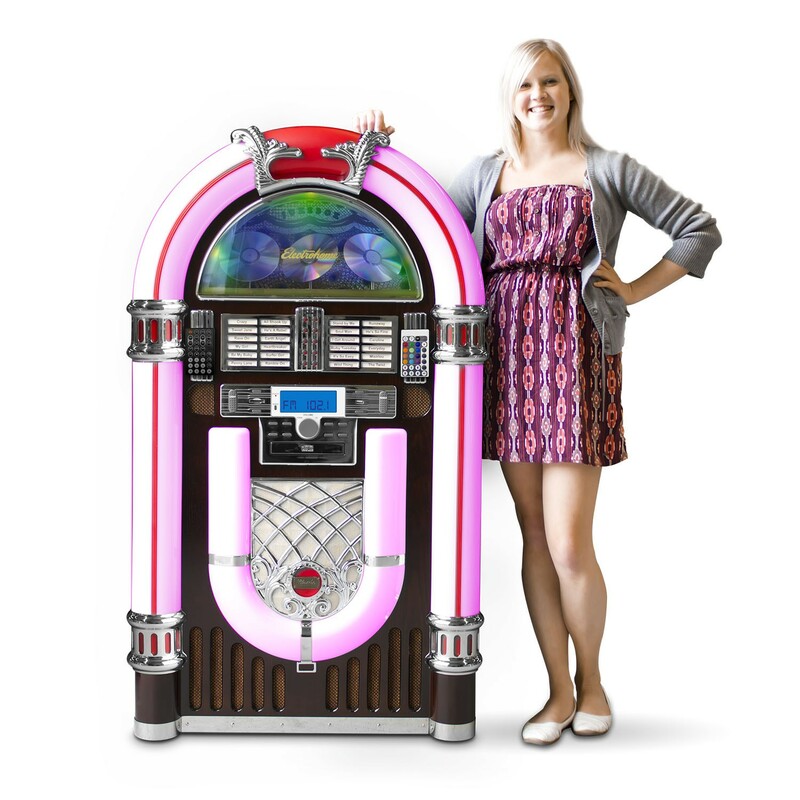 The first jukebox we received was defective and we had to send it back. The second one won't play CD's that I've burned myself and the door keeps opening and closing before finally playing professional CD's. To date we cannot get our IPods to play and once again we're having to contact customer support. Very poor product. 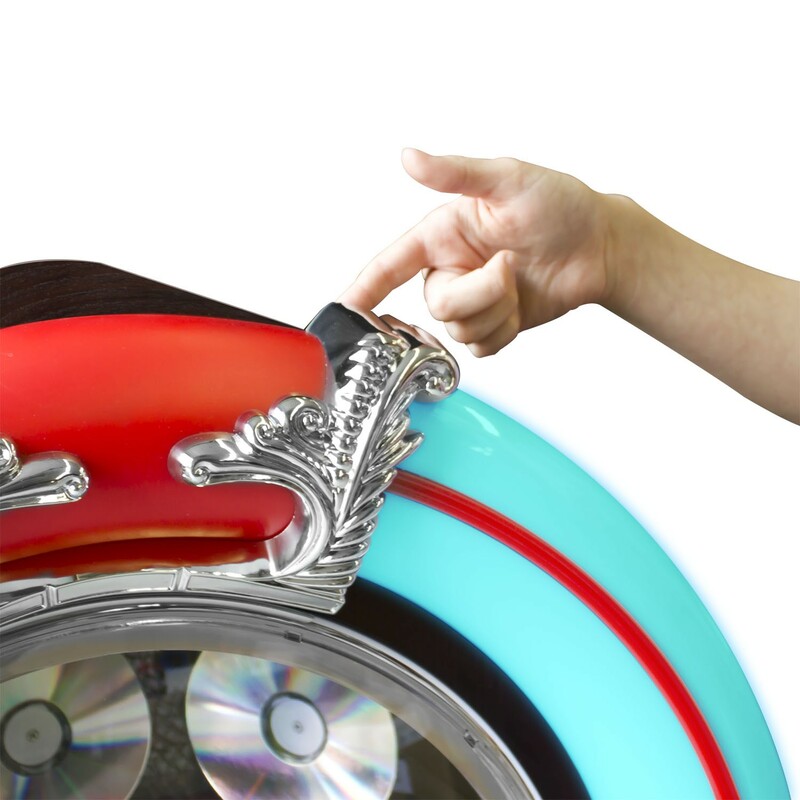 I don't think the word "jukebox" should be used to describe this item. 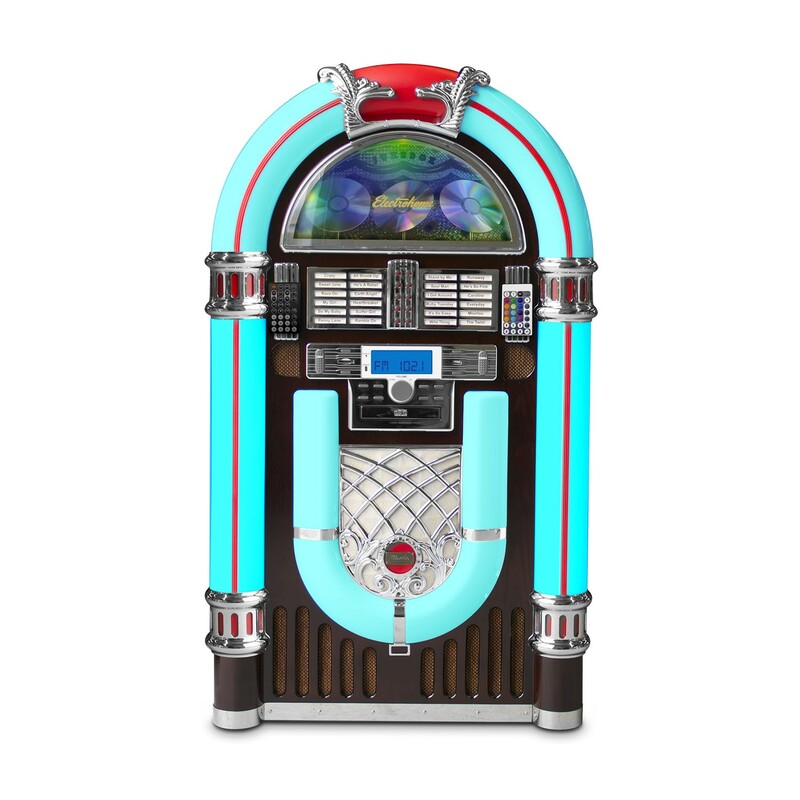 By definition, a jukebox is a partially automated music-playing device, that will play a one's selection from self-contained media. Those last three words -- self-contained media -- are the key to the definition. 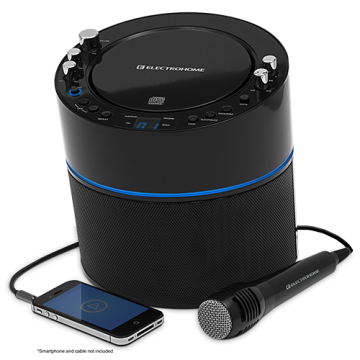 Since this device has no self-contained media, meaning that the user must either insert a CD into the front-loading tray, or connect some other source of music to it, this is really nothing more than an oversized CD player, or a speaker system for an iPod, with a radio tuner thrown in. 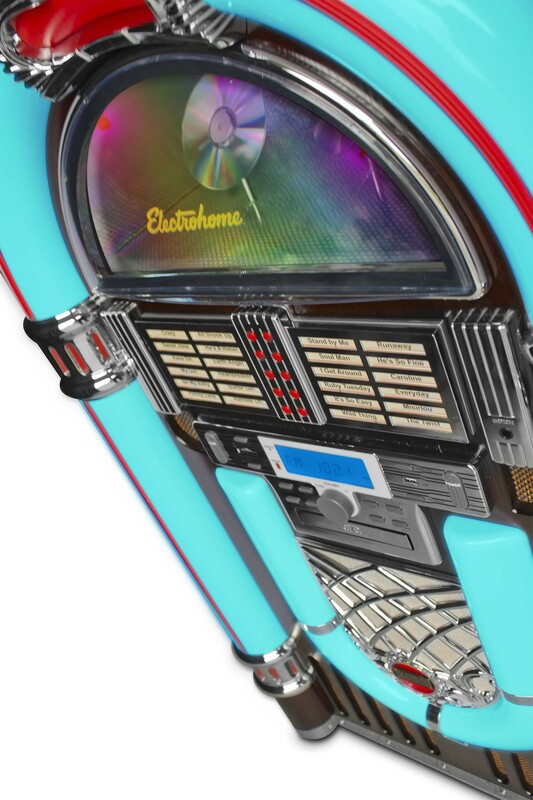 It might perform those functions very well, but that doesn't make it a jukebox, so please don't call it a jukebox. Sound quality is horrible. Nice looking piece but not great to listen to. 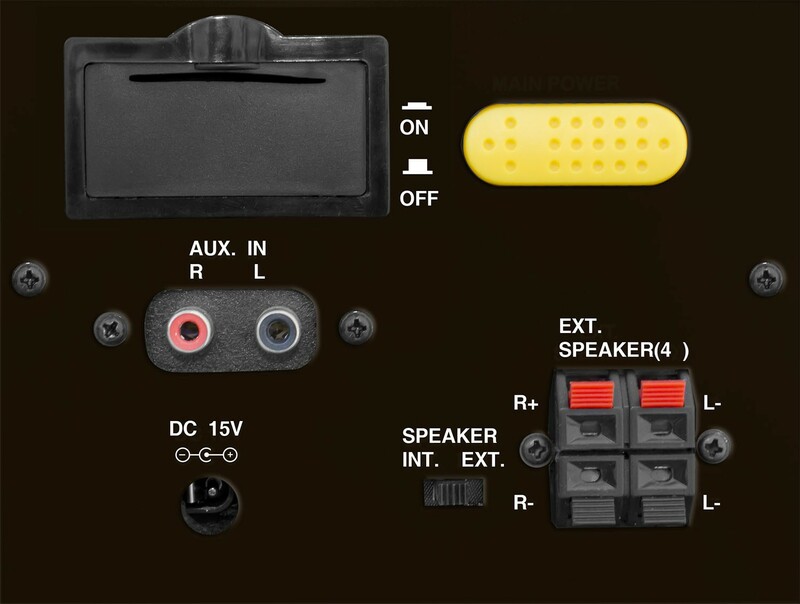 I am considering changing out the speaker and adding an amplifier. The product was just like it was pictured. The sound quality was great and the lights were spectacular!! My husband loved it!